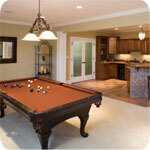 Transforming your home's basement into a finished space can prove to be very rewarding. Frequently the additional living space is used for a variety of entertainment functions including: Recreation Rooms, Bars, Gyms, Billiard Rooms, Home Theatres and Family Rooms. In addition, Bedrooms and Bathrooms are also incorporated into the floor space. Typically the square foot cost of finishing a basement is significantly lower than other floors within the home. Planning is critical before starting a Finished Basement project. From a financial standpoint, first determine how big your budget is and how you will finance the project. Will a mortgage be required or can you refinance or obtain a home equity loan? From the project standpoint, carefully consider what you want to use the space for. As part of this consideration, consider ceiling heights, existing pipes, Oil Tanks, and Heating and Water systems. Also consider lighting. To make a Finished Basement cozy, warm and comfortable, the number and kinds of lights to install is key. In addition, consider natural lighting. Can additional windows be installed and will they be appropriate for the finished space? Installing a Bathroom in a basement can be a challenge, particularly if a pump-up system is required. It is important you meet with a plumber before you start any work, as they will have many questions and requirements for your bathroom. Potentially the most onerous aspect of installing a Bathroom may be the removal of some of the cement flooring. This is a very dusty and messy job! Also consider heating. Does your existing furnace have the capacity to support the additional space? If not, you will need to consider putting in a bigger system or creating a secondary heating system. Finally, and probably the most important aspect to consider, is dealing with moisture. A finished basement will quickly loose its charm if water problems create mold and mildew. Basement floors and walls should be sealed and insulated to reduce moisture content in the basement. Even with these precautions, a dehumidifier may be required. Over the past 20+ years Mark Donovan has been involved with building homes and additions to homes. His projects have included: building a vacation home, building additions and garages on to existing homes, and finishing unfinished homes. For more home improvement information visit http://www.homeadditionplus.com and http://www.homeaddition.blogspot.com.